The operation sent millions of letters like the one picture above to students and families promising assistance in receiving financial aid. Paying for college out of pocket is nearly impossible for millions of prospective students. Instead, these individuals turn to scholarships, grants, and student loans, often relying on financial service programs to assist them in obtaining the funds. But not all of the companies promising a helping hand are looking out for your best interests. That was apparently the case for a California company accused of ripping off tens of thousands of victims in a nationwide financial aid scam. The Consumer Financial Protection Bureau announced today that it filed a complaint in federal court against Global Financial Support, Inc. and its owner, Armond Aria, for illegally charging millions of dollars in fees for sham financial services. According to the complaint [PDF], since at least January 2011, the company – which operated under the guise of a government or university-affiliated program – issued millions of marketing letters to students and their families under the names Student Financial Resource Center and College Financial Advisory. 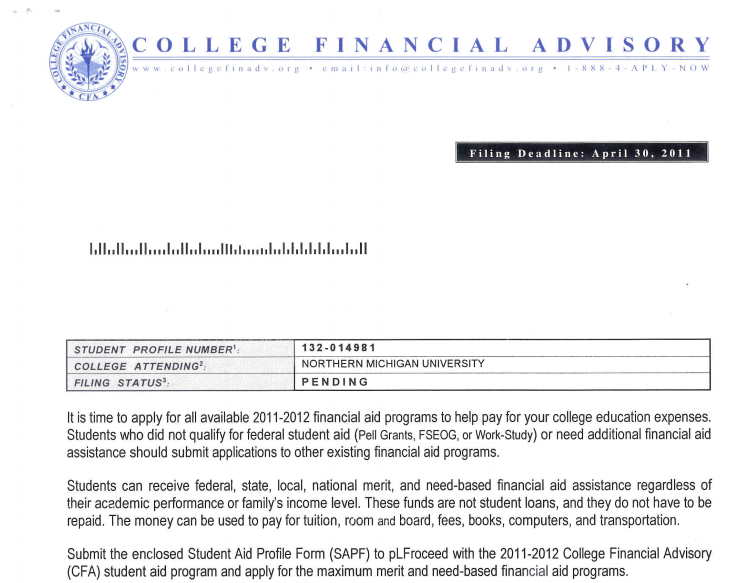 The letters, featuring logos and seals to appear as if they were sent from or endorsed by the government, instructed individuals to fill out and return an application and a fee — ranging from $59 to $78 — to apply for maximum merit and need-based financial aid programs. By paying the fee, the company promised it would conduct extensive searches to target or match prospective students with individualized financial aid opportunities. In reality, the complaint claims applicants either received nothing or a generic booklet that failed to provide individualized advice. The CFPB alleges that the operation also created a false sense of urgency and used fake deadlines in order to pressure students and families into enrolling and paying for the services. Through the lawsuit, the Bureau seeks to stop the company’s unlawful practices and order the defendants to provide restitution to those scammed by the operation.